I’ve been on a succulents kick lately and have been collecting them like crazy. It’s my new thing to do – head over to a nursery and just walk around looking and wishing that my succulents were this beautiful. This past weekend, on one of my wanderings, I walked by the air plants section and a whole bunch of them were hanging up like jellyfish. I’d seen them before, but this time, I took one apart really gently and realized that the air plant was just hung on a fishing line and threaded through a shell. Well, lightbulb! 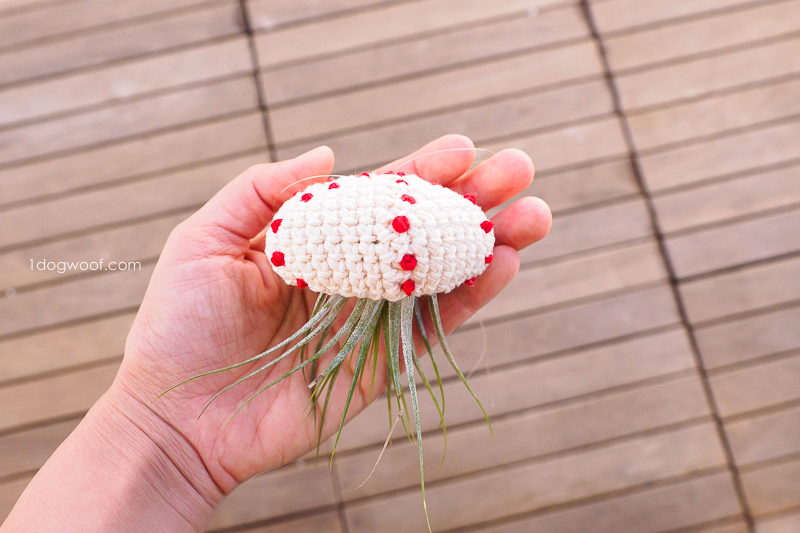 And you know you can’t let lightbulb ideas fester, so I came home and made myself a crochet air plant jellyfish just like that. 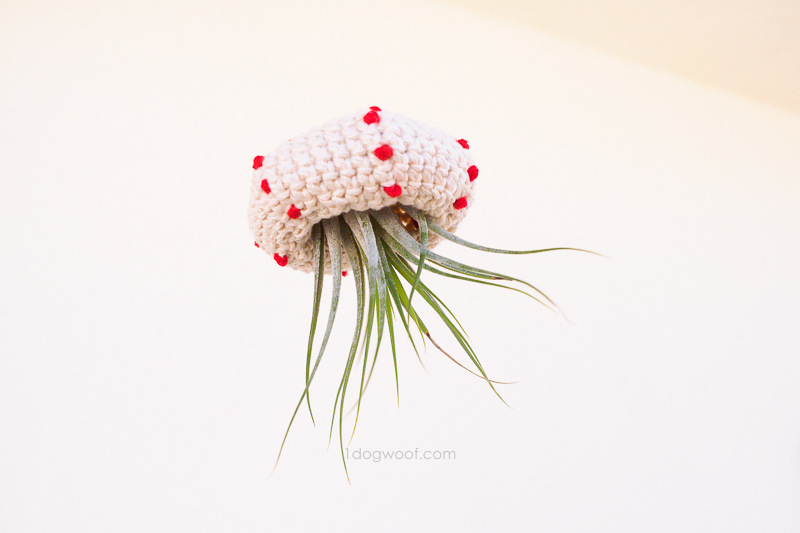 Oh yeah, I did have the air plant already, but it usually sits in a little shell – I never thought to hang it up! This is a super quick project. It’ll maybe take an hour of your time. 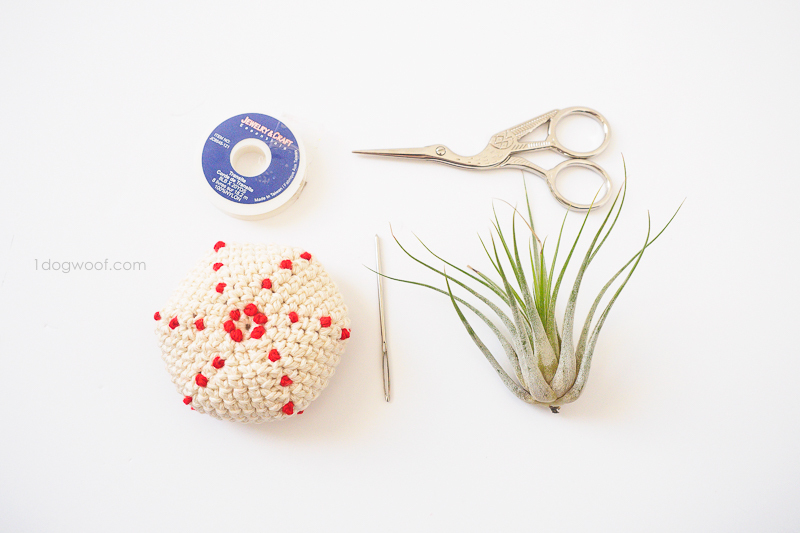 I admit, these are also the most satisfying little projects – instant gratification, you know! 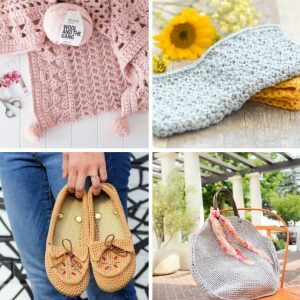 I used a bit of Lion Brand 24/7 Cotton Yarn that I had received for a different project, but this one doesn’t much yarn at all – it’s a great scrapbuster project! I chose cotton because I wanted a clean look and I also needed a stiffer yarn so the jellyfish cap can hold its shape a bit. I think kitchen twine or rope or jute may work really well too. For the french knots, I also used 24/7 Cotton. 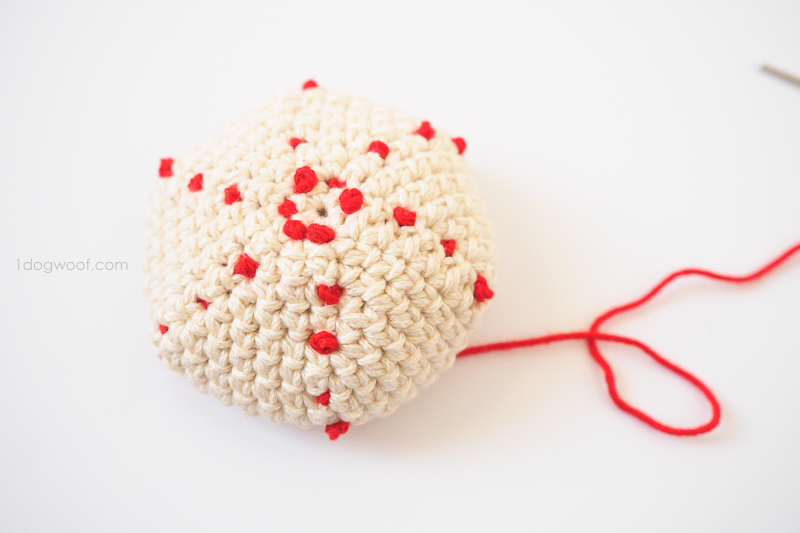 Finer designs may require a thinner yarn, maybe even embroidery thread. I found this tutorial for french knots, which was super easy to understand and it got me making little knots right away. 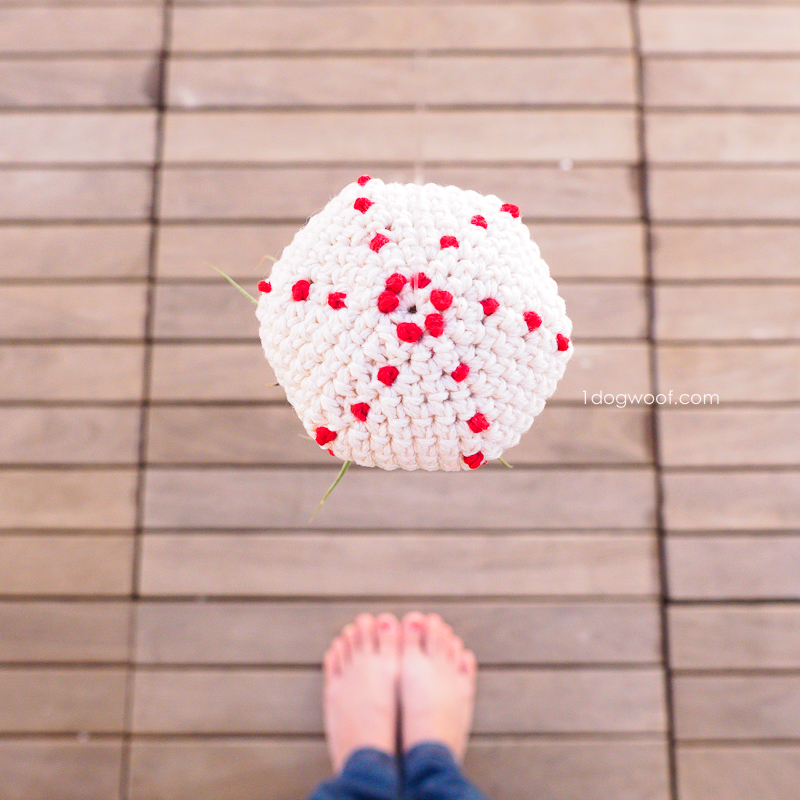 If you use a very light yarn, you might even be able to crochet some picots on the cap. One thing I noticed while making this is that the french knots sometimes get pushed to the inside of the cap. Once everything is done, you’ll want to pull on the knots a bit to make them stand out more. There’s not too much left to say about this simple project. Once you make a plain cap, you can embellish it any way you want. 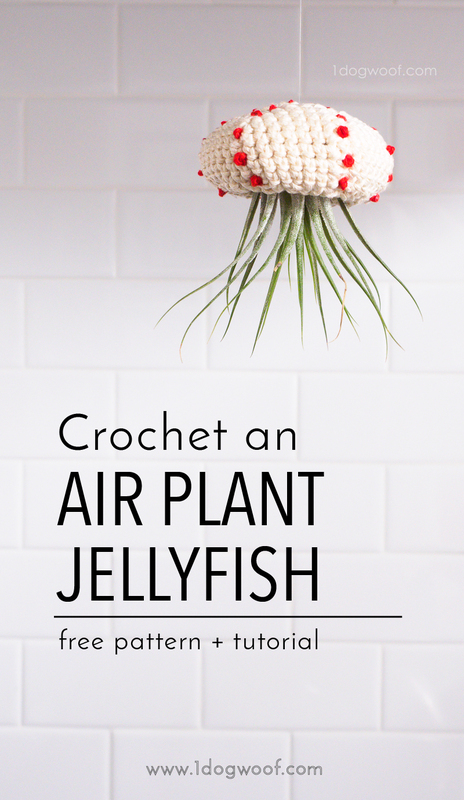 Just like your colorful army of Friendly Jellyfish hand towels, you can have a wide array of air plant jellyfish as well. With regards to the air plant itself, I’m not much of an expert. I do what I was told when I bought it – soak it in a bowl of water for a few hours every week. With this setup, you can just take the cap off and soak the plant and then thread it back up. Gauge is not applicable for this project. Final size of cap is approximately 3 inches, but size can vary based on yarn, hook and tension. The cap is worked in seamed rounds. Cap as shown is flipped inside out. Fasten off and weave in all ends on the right side of the cap. Then flip the cap inside out for a unique texture! Cut a long strand of embellishment yarn, color B.
Thread through a hole from Round 1, leaving a short tail underneath the cap. 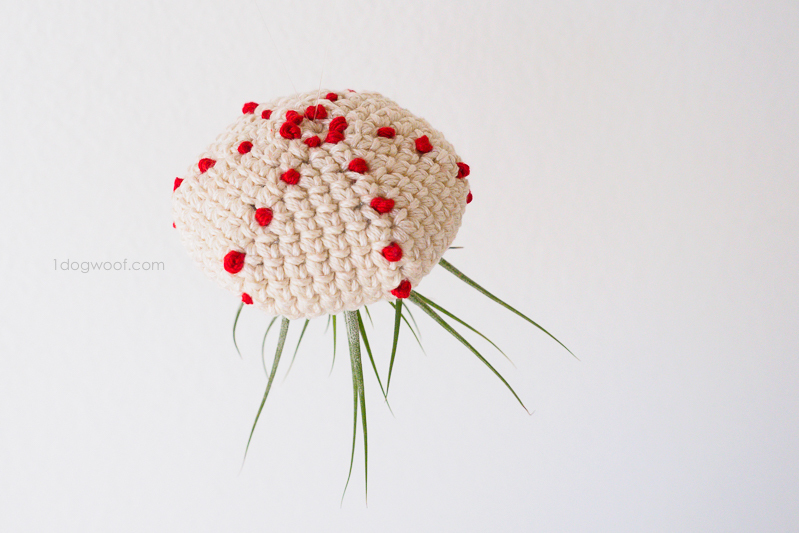 Make a French Knot on the surface of the cap. Repeat threading the yarn through each hold where you want the French Knot, keeping all unsightly carries under the cap. 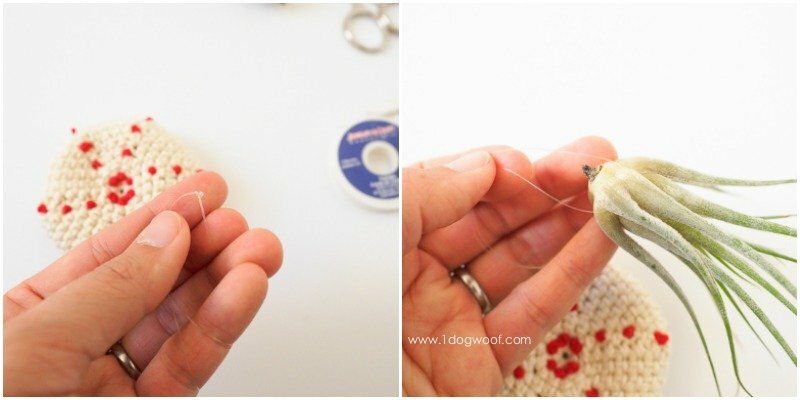 Cut a length of invisible fishing line or thread. 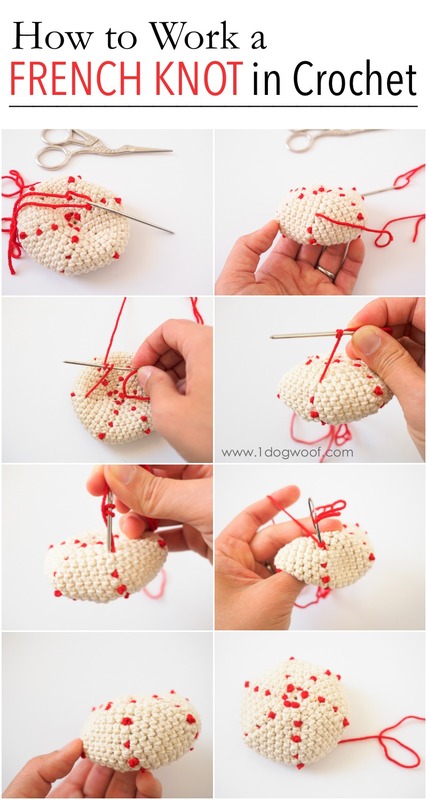 Fold in half and tie a knot at the end to make a loop. Hang the air plant off the loop. 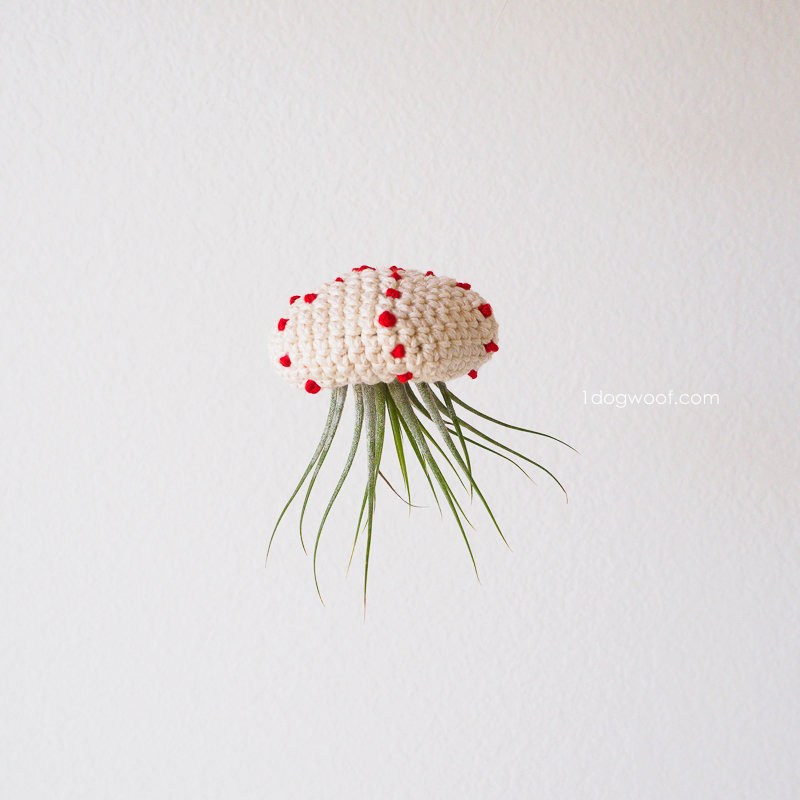 Thread the loop through the top of the jellyfish cap, and pull up so the air plant gets tucked into the cap. Adjust the cap as necessary, and hang! 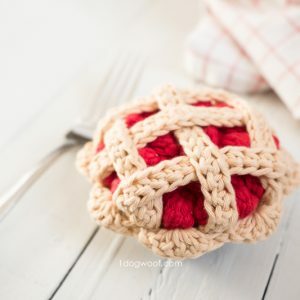 This was such an easy, quick little project, and would work great as a housewarming gift, or a hanging mobile anywhere in the house. Will you be making 1, 2, or 50? Omg, does it get any better? What a great lightbulb result too! Charming!!! What a fun idea!!! Thanks for sharing!!! I did not find the crochet hook size in the Jellyfish pattern. Love the pattern!